Historically, ‘Specimen Books’ were used to display various typeface examples. Taking the ideas of display and informational storage, we will construct a new form of specimen book. Using an accordion-folded spine, we will build pages with pockets and boxes to store and display items. Pages with room to write about each “specimen” will also be included. We will use Scratch-A-Prints to create simple background patterns for our pages, and spend some time writing brief stories about our displayed items. Bring a few things that you’d like to display! Keep them fairly small, and fairly flat. Erin Sweeney is an artist living and working in New Hampshire, having just completed her MFA in Book Arts and Printmaking at the University of the Arts in Philadelphia, Pennsylvania. She holds a BFA in sculpture from the Maine College of Art in Portland, Maine. Her current work combines fibers, text, and the book form. She is interested in all forms of building, be it conceptual or physical. Her current work revolves around the concepts and processes of building community. Making handmade objects, manipulating space, and utilizing printmaking processes in non-traditional ways are all a part of Sweeney’s vocabulary. She continues to show work nationally, most recently at the Hunterdon Art Museum in Clinton, NJ, Donna Seager Gallery in San Rafael, California, and at the Skybox at 2424 Studios in Philadelphia. Additionally, Sweeney is an instructor, teaching book arts workshops at her Lovely In The Home Press, 30 Main Street, Peterborough, NH. $20 materials fee, payable to instructor. Kami-ningyo is Japanese for paper doll. These folk dolls have been made for centuries as playthings and decoration. They are fashioned from paper folded around a narrow cardboard base, and typically with small faces with no features so they can represent any one. Their Kimonos are usually made from hand screen printed washi paper (made from mulberry bark. You will make a simple Kami-ningyo and learn the basic parts of a traditional Japanese kimono. There will be a display of dolls and other craft related items. Please bring your own scissors and a ruler. ALMA LUZ CASTRO started costuming as a child and is now a versatile dollcrafter and a miniature costumer. She has won numerous ribbons and best of show in doll and costuming competitions. Alma received an award from the Pennsylvania Council on the Arts in 2007. Her works have appeared in various publications for dolls and miniatures. We are requiring that a parent or adult supervisor accompany each child. Please join us Thursday July 29th, 6-8 pm at PCB On South for an artist talk with member artists Thomas Parker Williams and Lara Henderson, speaking on the topic of structure. Please join us for two exciting workshops with artists Esther K. Smith and Carol Barton. Both workshops will be held in our storefront, located at 626 South Street, and are limited to 12 participants. To register, send an email to store@philadelphiacenterforthebook.org. Pop Art meets book arts in this introduction to ancient longstitch binding--an easy multi-signature structure that opens flat and pre-dates printing--you will stitch your sections directly to the covers. You will make a journal and a sketchbook from to start to finish--and you maybe have time to experiment with the form. Warning: grocery shopping will never be the same. And you may never throw away another box. You can bring your own bone folder, sharp scissors, the paper you most love to draw on--and/or old leather pants or the cover of an old hardback book to upcycle--and collage materials, rubber stamps, or color pencils if you'd like to make these into artist books. Esther K Smith wrote and co-designed HOW TO MAKE BOOKS, MAGIC BOOKS & PAPER TOYS and THE PAPER BRIDE. She collaborates with hand-typographer Dikko Faust and other artists and writers at Purgatory Pie Press in New York City. Solo exhibitions include London's Victoria & Albert Museum and Metropolitan Museum libraries, RISD, Harvard, Pyramid Atlantic, Minnesota Center for Book Arts, and San Francisco Center for the Book. Museum collections include MoMA, the Whitney, the National Gallery of Art, Walker Art Center, SF MoMA. Smith is a member of Linda Montano's Seven Years of Living Art performance as the EK Smith Museum-- including the Apron Collection. A special kind of creative magic awaits you in this workshop. You will learn basic on-the-fold pop-up structures, then progress through a series of more complicated three dimensional glued constructions. Props, platforms, and V-fold pop-ups will be covered. Emphasis will on developing an understanding of the simple mechanics involved in this art of "paper engineering." A slide show on the history of pop-up and movable books will be included. This is an ideal class for artists, teachers, graphic designers, and anyone who loves to play with paper. No prerequisite. A few art materials such as markers, colored pencils, collage materials, rubber stamps, etc. Carol Barton is a book artist, curator, and teacher who has published several editions and has organized both local and national shows of artists' books. Her work is exhibited internationally and is in numerous collections, including the Library of Congress, the Museum of Modern Art, and the Victoria and Albert Museum in London. She served as curator for the Smithsonian Institution's exhibition Science and the Artist's Book. She has taught at elementary, high school, and university levels, as well as conducted adult workshops at art centers across the United States. She is on the faculty at the University of the Arts in Philadelphia, where she teaches courses in bookbinding and book structures. She has had residencies at the Bogliasco Foundation in Italy and the Sacatar Foundation in Brazil. Her pop-ups were featured in National Geographic Magazine's July, 2005, article Zip Code 20812: It's Only A Paper Moon. Her most recent book, The Pocket Paper Engineer, is an artist's how-to book on paper engineering. As part of the Philadelphia Center for the Book's exciting program for our Arts on South space, we are scheduling bi-monthly artist talks that drawon the strengths of our membership. Each talk will feature 2-3 artists, with each artist speaking for 15-20 minutes with time afterwards for questionsand discussions. Our first talk will be Thursday, July 15 at 6pm. The theme of this talk is "home" and the artists chosen to speak on this topic are Alice Austin and Mandy Dunn Sampson. Please join us for these talks at 626 South Street. Little Berlin is now accepting reservations for their 2nd B.Y.O.T.Y. Book Fair. Cost for a space is $20. And if you have no idea what B.Y.O.T.Y. stands for, it’s bring your own table, yo. Last year they saw some pretty interesting set-ups via blankets, crates, found wood, etc. and would like to keep the bring your own table spirit alive in correlation with make your own literature. Last year they asked all participants to donate a book to help them start their new collection. 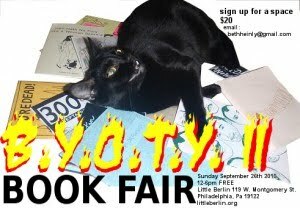 For the second annual book fair at little berlin they want to make a book. All participants are asked to bring one or two or three or four (you get it, however many) sheets of 8 1/2 x 11 paper with whatever your heart desires to print, paint, glue onto them. At the start of the day they’ll collect the artwork and throughout the day they’ll bind a book. email: bethheinly@gmail.com to reserve a space.